and right now I am smack, dab in the middle of a busy season in my life. With three of my four kids playing ball, practices three times a week for each child, and two to three games a week on top of that for each child is making me one busy mom. I feel as if I am spending my entire time at the ball park. Take tonight for example Bubbles has practice at 5:30 at the middle school, Little Man has practice at 6 at the fairgrounds, and Sunshine has practice at 7 at the park. Which means I am going to spend my evening running all over town tonight, and it means another night of dinner from the McDonald's drive-thru for the third time this week. I am trying to off-set the fast food dinners by cooking at lunchtime instead of suppertime. Usually around here we have a small lunch since we are in the middle of school, and have a large dinner, we've just reversed things for a while. 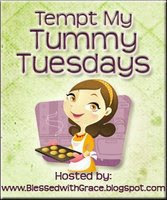 Join us at I'm an Organizing Junkie for more Menu Plan Monday. Since I get to stay home all week, I am also going to skip the grocery store this week and cook using what I already have on hand. After years of structured science curriculums with my older kids, and Apologia Astronomy last year with all of the kids I decided to take a more relaxed approach to Science this year with my younger two. We have been studying more interest based Science topics using living books and experiments, along with a lot of nature study. I must say I am absolutely LOVING this approach! It's been such a fun year, and the kids have really enjoyed it. I am honestly surprised by how much they have learned just reading and having fun. Next year Sunshine will return to a text based Science curriculum since she will be in fourth grade, and I feel she will be in need of a more rigorous curriculum but Little Man and I will definitely continue on this relaxed science journey. We have another busy week ahead of us. I feel like a broken record everytime I say that but it's the truth! Sausage and Bacon were on sale last week so we will be having breakfast foods for dinner a couple of times this week. I also have a ton of chicken in my freezer so we will be eating that a couple of nights as well. Well, it looks like we will be going camping tommorow. It is kind of last minute, but the weather has been wonderful, Saturday morning softball practices have been cancelled, and the wonderful campground with an indoor pool that isn't too far from us is offering a two nights for the price of one special so we just couldn't resist. The last minute camping plans have meant that I needed to plan some meals for us. Since we will be staying two nights I will need meals for three days. I don't worry so much about typical "camping" food when we go camping, especially since we go so often I try to concentrate on easy to prepare meals. I know I have an advantage over most campers since we have a thirty foot travel trailer that is complete with a fridge, microwave, stove and oven, yes I was lucky enough to get one with an actual oven. We also carry one of the indoor/outdoor George Foreman grills in our camper for grilling out. I highly recommend it! It's going to be another busy week around here, which means more nights of eating out, which as I have said before I don't really like but it's one of those unnecessary evils that are life requires right now. Since it is going to be a busy week, I have some pretty easy meals planned for the nights we will be eating at home. This recipe actually came into exsistence out of necessity. I had planned to make my normal dinner rolls for dinner earlier this week, when I discovered that we had no milk. I don't know if anyone else has this problem or not but our house have these magic refrigerator fairies, they come along and drink all the milk. It's truly amazing, no one will claim responsibility for using all the milk and not telling mom, so it has to be the fairies. Sooo, my dinner roll recipe requires milk, which I have none of, and I really needed to make some rolls for dinner. I ended up tweaking my breadmachine breadstick recipe (which I discovered I have not yet posted here) for dinner rolls. I wasn't sure how it would turn out, and honestly, I was expecting the worse, but everyone loved them. They are actually much, much better than my normal dinner roll recipe. I received an email yesterday from Fabric.com offering a savings of 15% site wide on any purchase of $50 or more at Fabric.com, for my readers. To get your savings use code DOD409! Hurry because this offer Expires on 4/12! Click here to save. 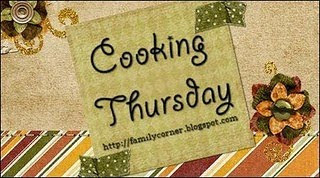 Join us for Cooking Thursday at Diary of a Stay at Home Mom. There are several recipes that I use on a regular basis that I tweak to fit my family, I never realized how many recipes that I actually do tweak until I started blogging. Olive Garden's potato soup is one of my family's favorite soups, and I found an excellent recipe a few years ago that is always the basis of my own potato soup recipe but I don't cook it the way that they do. For one my family doesn't like the kale, and second we have a large family so we require a large pot of soup. So I thought I would share how I make it. Recipe is for a family of 6 with leftovers. I didn't get as many pictures from Easter as I had hoped but I did want to share a few of the ones I did manage to take with you. Our table set for dinner.... Look how dark and nasty it looked outside when we got up. Fortunately the sun did eventually make an appearance. I hope everyone had a wonderful Holy Week and great Easter. It was a busy week for us, and I didn't really get to stick to my Menu Plan. This is something I really need to work on, menu planning works, I know it works, and I struggle with sticking to it. Maybe I need to plan easier meals? I am not sure. I know another big problem is that I need to be realistic with my menu. I don't like to eat heavy foods during the warmer weather, and my schedule is really picking up, I have to admit that we are going to be eating out more often than I like since we will be on the road so much. This week is lining up to be another busy week but hopefully I can stick to my Menu Plan a little better. We live near Louisville, Kentucky where the Kentucky Derby is run each year. From April until the first Saturday in May the area is a buzz with all things Kentucky Derby. People around here, my immediate family members included, live, breathe, and eat horse racing this time of year. While there are many things associated with the Kentucky Derby that I am morally opposed to I still find this time of year a magical time. One of the lovely ladies in a homeschool group I am a member of has written a unit study on the Kentucky Derby that is complete with a lapbook to use alongside the study. You can find her free unit study for free here at Homeschool Share. Not only did Marcy write this wonderful unit study but she is also a blogger, so be sure to visit her on her blog Ben and Me for more homeschool inspiration. For the past week the younger two kids have been doing a unit study on Crocodilians for their science. It's been a fun study, and I wanted to share what we did in case anyone else is interested in doing their own unit study. Who Lives in an Alligator Hole? was my favorite out of the books that we read for this study. It was well written, very informative, and held their attention. Just perfect for two squirmy kids! At the end of the book was an activity where the kids were able to make their own alligator hole to show the importance of alligators for the environment. The kids loved this activity! But of course why wouldn't they it involved dirt and water, which of course created quite a mess. Crocodiles and Alligators was another book that we read. It was a great book, with a lot of information but I wouldn't recommend it if you have younger ones that don't sit still very long as it is quite a long book.